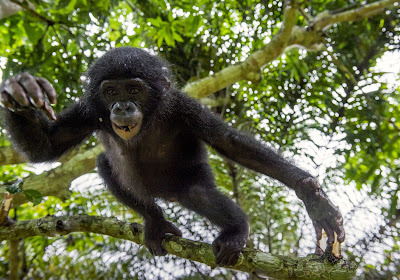 A juvenile bonobo leaps from a branch. The bonobo, a threatened species of great ape found in the Congo Basin, is the closest existing relative to humans, along with the chimpanzee. An extensive review of research on wild primate social networks and parasites underscores the importance of super-spreaders, or central individuals that play an outsized role in transmission of a pathogen. Trends in Parasitology published the review, the first comprehensive synthesis of environmental and theoretical studies of disease dynamics in wild primate species — most of which are now threatened with extinction. About 60 percent of the more than 500 known primate species face an extinction threat and more than three-fourths of them are on the decline, due to loss of habitat, hunting and disease. Large chunks of the world’s forests are succumbing to agriculture, mining and logging, bringing people, primates, pets and livestock into closer proximity. That juxtaposition sets the stage for more pathogens to jump between humans and our closest relatives. More than 20 percent of wild primate species harbor parasites capable of spilling over into humans. HIV, Ebola, yellow fever and respiratory viruses are examples of viruses shared by humans and wild primates. “How an emerging pathogen spreads through a species tends to be ‘a black box’ until it causes an outbreak among people,” Gillespie says. The Zika virus, for instance, was first identified in monkeys in Uganda in 1947 but was not widely studied until recently, after it started sweeping through human populations. Traditional infectious disease models generally assume that all individuals within a population have an equal probability of receiving or giving an infection, but more powerful analytical tools are showing that is not the case. The so-called 80-20 rule – 80 percent of disease transmission events in an epidemic are caused by 20 percent of individuals – is now a well-established phenomenon. What’s not yet as well-understood are all of the variations within a disease system, and how these variations can combine to make an individual a super-spreader. Combining knowledge of behaviors by individual species with data on their parasites can help researchers sort out high-risk traits and identify super-spreaders that contribute to transmission in a predictable way. Such patterns can help researchers to develop targeted interventions. The review cites the example of a vaccine under development for Ebola virus, which is designed to replicate and spread immunity from a few individuals to others in a population. Targeting the most central individuals in an ape group with such a vaccine may be an effective way to mitigate future Ebola-related ape die-offs and spillover events into human populations. The review also lays out a vision for the next decade of research into pathogen transmission, one that integrates ecology, behavior and evolution for studies of wild primates, other wildlife and humans. Co-authors of the review include Julie Rushmore of Oregon State University and the University of Georgia, and Donal Bisanzio of the University of Oxford.